For this tag you will want the amazing Hawaiin Girl tube by Kent Stein which you can currently find at Artistically Inclined Licensing HERE. You must have a license and display it within your creation to use any of the tubes from AIL. 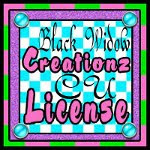 I am using a PTU kit by Crystal's Creations called Summer Blast you can find HERE. Pick up the FTU mask 382 by Insatiable Dreams HERE. 2. Drag and drop mask into canvas. Scale to 541x541. While it's the selected/active layer in the layers box, go to COLORS>INVERT and LAYER>TRANSPARENCY>COLOR TO ALPHA. R click on this layer in layers box, ALPHA TO SELECTION then click on paper 2 to activate layer. SELECT>INVERT then hit DELETE on keyboard. The paper is now the mask so you can delete the original mask layer. Add drop shadow to elements with asterisk (*) by going to FILTERS>DROP SHADOW>LIGHT and SHADOW with settings at -3/4/6. 4. Add tube of choice. Remove extra layers. I flipped the full size, COLOR>DESATURATE then up to MODE in layers box and chose SOFT LIGHT. Scale other tube to 235x520 and add drop shadow to this layer same settings as before. Add in the correct current copyright including copyright symbol, artist's name, website, and license number when applicable. 5. Using the rectangle select tool, make a selection inside the frame, so it's just in the middle of the frame. Go to SELECT INVERT then click on the following elements in layers box and hit DELETE- 8, 12, 7, 2... SELECT >NONE. 6. I am using a font called Strawberry Limeade in white, then R click ALPHA TO SELECTION grow by 2, add a new layer and fill with shades of blue using the blend tool. Drag upwards on linear so darker shade is on bottom. Go to FILTERS>NOISE>RGB NOISE with settings on correlated only and 20/20/20/0 checked. Add drop shadow with same settings as before. For an extra pop, click to activate the white text, go to drop shadow and put settings at 1/1/1. 7. While the background layer is selected, go to COLORS>INVERT to make it black. Then use the rectangle tool to crop the perimeter of your tag. When everything you want in the tag is in and the excess is out of the selection go to IMAGE>CROP TO SELECTION. Thanks for checking my tag. Leaving you a couple snags too. Do not change or add to these whatsoever. Congrats, thank you and hugs and kisses in Hawaiin.